A new tip says that Nvidia may actually be the first to launch a 64-bit ARMv8-based chip for Android devices in 2014. This is surprising because Nvidia only showed us that the Denver/Maxwell-based chip would arrive chip would arrive in 2015, and will be made at 16nm FinFET. In a way, it makes sense, because initially Denver was promised for late 2013/early 2014, and it’s possible Nvidia tried to mislead its competitors with the above roadmap, by making them think that they will still only use a Cortex A15 CPU in its Tegra 5, along with a Kepler GPU. I could see this from Nvidia, because they usually have a “trick” in their hats, when they announce their new chips, something the others weren’t expecting. 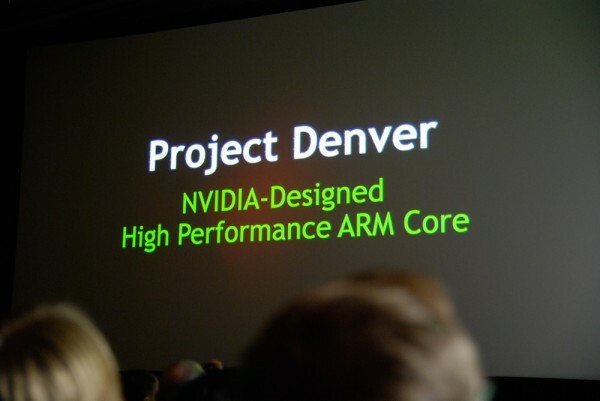 Denver is Nvidia’s own custom CPU core, based on the64-bit ARMv8 architecture, which they licensed from ARM since 2010, and a CPU core they intend to use from “super phones to super computers” – a phrase Nvidia likes to say many times. Combined with the upcoming Maxwell GPU, that would give them a super streamlined chip product line, because they can re-use the same chips from smartphones, all the way up to servers and even super-computers (where energy efficiency matters). They’d all have the Denver CPU and Maxwell GPU. That could be great cost-saving for Nvidia. Put all of that on 16nm FinFET, and they would have something really competitive, that other players, especially in the higher-end markets (servers, etc) should really fear. But that isn’t coming until 2015. What we’re likely to get this year, at best, is a Denver CPU, and a Kepler GPU, made at 20nm. The last part is really up in the air right now, because Nvidia could repeat the mistake of going with the old process when everyone else is switching to a new more efficient one. They made this mistake in 2012 with Tegra 3, and it cost them dearly, forcing Tegra 3 into quickly becoming a “mid-range” chip for the rest of the year as soon as other 28/32nm chips came out that year. If Nvidia is smart, they won’t repeat that mistake, and will make Tegra 5 at 20nm, even if it costs more to do that. It will be well worth it in terms of marketing, mind share and sales, and both Qualcomm and Intel are living proof that moving early to a new process pays big time, and then everyone wants those chips, including OEM’s and smartphone customers. Now the bad news: it’s a little disappointing to see Kepler in 2014. 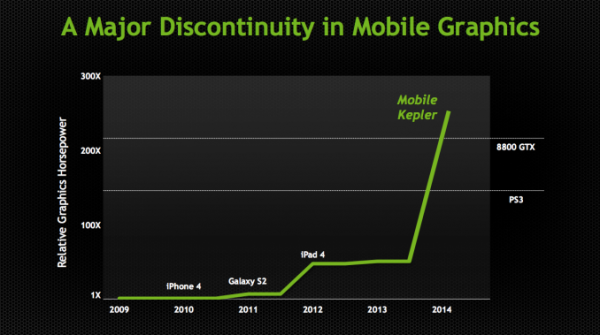 Kepler wasn’t supposed to be in Tegra 5. It was supposed to be in Tegra 4, and many rumors said so since 2012. Plus, it made complete sense. Every other mobile GPU out there supports OpenGL ES 3.0, and is based on a unified shader architecture. Tegra 4 is the only one that isn’t this year, and it’s still using the old Tegra 2 architecture, but with more cores. I don’t think that was something Nvidia just omitted. Mobile Kepler was delayed so much that it made it impossible for them to use it in Tegra 4, which is too bad because it might’ve made Tegra 4 a more compelling chip. Nvidia has had way too many delays over the past few years. Whoever is in charge of Nvidia’s operations and execution, needs to run a tighter ship, or Nvidia will never succeed in the mobile space, even if in theory, they should. No matter how great their plans are, if they don’t deliver on time, the competition will catch up or even surpass them, which has already happened many times before. 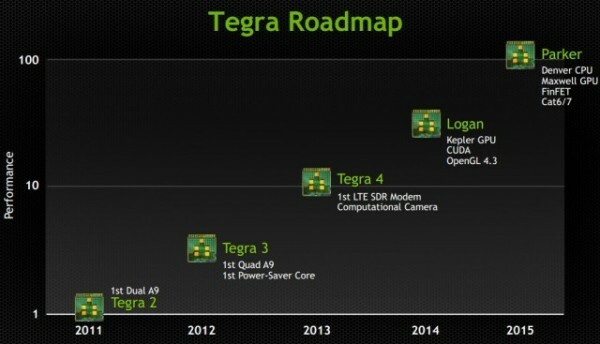 We’ll see how Tegra 5 with Denver and Kepler does next year. Nvidia showed Kepler to be very efficient, and on top of that, it should also be the most advanced mobile GPU by far, supporting all the GPU features of PC’s (although some of them may be too power hungry to use in mobile games, but it should still offer great flexibility for developers). So while I think it’s disappointing Denver is not launching in the same time with Maxwell, I think Kepler on its own will do fine. Frankly, I’m a lot more worried Nvidia will go with a 28nm process in 2014, instead of 20nm, which would be a huge mistake. The year 2015, should really be the big year for Nvidia in mobile. Not only is Maxwell finally arriving, helping Nvidia finally deliver on that “streamlining” dream between its chips, but it will also be one of the first mobile chips on 14/16nm FinFET, which could put them ahead not only of other ARM chip makers, but of Intel, too. Intel may have to delay the 14nm Broadwell until late 2014 or early 2015, and that’s just for notebooks. Its smartphone chips usually adopt the new process about a year later, so in theory Nvidia should be ahead of Intel by at least 6 months. It probably won’t matter though, since I don’t see Intel making big strides by then in mobile anyway, but it’s interesting to see that even on the technical side, ARM chips makers will finally catch up (14/16nm and FinFET) or beat Intel. So while it would be big news for Nvidia to release Tegra 5 next year with its own custom core based on ARMv8, which I’m sure will be very competitive in terms of performance/Watt (but only if it’s made at 20nm), I’m a lot more interested in Tegra 6/Parker in 2015, and if Nvidia finally executes on time, they could start growing significantly again in the mobile market (and also in other higher end markets). Please have tegra 5 with 20nm launch early 2014, with 64bit tegra 6 for holiday 2014 devices– that would give nvidia a serious advantage.